Contributed animations to the Chicago Cultural Center’s live showcase of up-and-coming Chicagoland based artists and bands—who are given the opportunity to play live for a panel of Artists & Repertoire (A&R) executives from major and independent record labels. Contributed animation work to the Chicago Department of Cultural Affairs and Special Events, Youth Arts Showcase. Which happens to be the largest celebration of young artists in Chicago, featuring the works of hundreds Chicago’s creative youth. Group Show at Essentia store gallery Chicago, features two reimagined pieces from Impermanence on display. Two animations are featured on display as a part of the Let it Move Ya section for the Bronzeville Echoes exhibition at the Chicago Cultural Center. CHICAT Anniversary Exhibition showcased the work of multiple artist. I contributed two pieces—a large acrylic as well as a backlit light box for the show. The Black Creativity Juried Art Exhibition is the longest-running exhibition of African-American art and has been displayed annually at MSI since 1970. On display in the exhibit is my piece Equinox 30" x 30" back lit light box. The Electric Ghost series of animations on display at Sidewinder Gallery. Solo show of acrylic prints set against the background of vibrant hand-crafted rugs, on display at Organic Looms (Chicago). Window installation of acrylic prints and mylar and floral sculptures on display at Ignition Project Space. 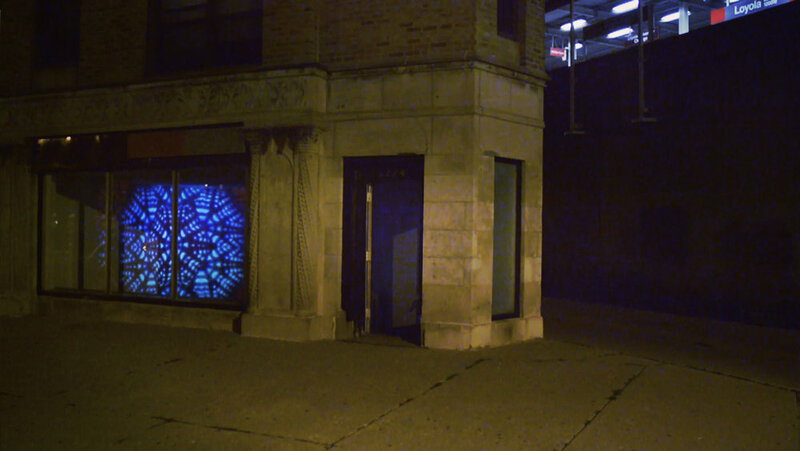 My work will be featured as part of a video series projected after dark on the windows of the Roman Susan art space. Only visible from the street, videos are displayed with the city serving as the soundtrack. Work will be displayed between 5pm-11pm. Glitter Landscape entry for speculative designs for public artworks in Chicago. Exhibit will be held at Chicago Industrial Arts & Design. Historical Rogers Park photos reimagined through animation, through a dream sequence in time. Presented at the Rogers Park Historical Society. The Impermanence body of work is currently on display at NYCH. If you have an interest in seeing the work, feel free to contact me at rkscott.xo@gmail.com to schedule an appointment. The Impermanence body of work is currently on display at The Belmont by Reside lobby. If you have an interest in seeing the work, drop by the Reside lobby anytime. Series of animations and music videos on display at Slate Arts and Performance. The work featured on display at the Essentia store gallery, Chicago, is a fraction of an ongoing 6 year project. These excerpts, represent one step along the way, in the completion of 60 short animated films, based on the personal diary entries, made between 2010-2012. If you have an interest in seeing the work, drop by anytime during Essentia's business hours. The work featured on display at the office of CallisonRTKL, Chicago, is a fraction of an ongoing 6 year project. These excerpts, represent one step along the way, in the completion of 60 short animated films, based on the personal diary entries, made between 2010-2012. If you have an interest in seeing the work, feel free to contact me at rkscott.xo@gmail.com to schedule an appointment.